Here is an example of trunking installed just below the window sill in an office that will not be identified. Viewed from a more conventional angle one can see a South African electrical socket on the cover over the top duct and several sockets and cables attached to the cover on the bottom duct. 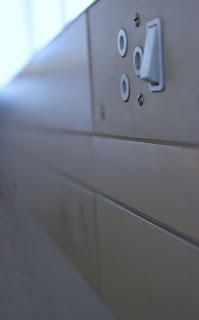 The first socket on the bottom lid is an old South African telephone socket featured in an earlier post. It is no longer being used in this installation. Next, just below the electrical socket, is a pair of thinnet coaxial cables. The logic of having a pair is that one goes to the left in the duct and the other to the right. The coax cables are no longer being used in this installation. The third item is a pair of RJ-45 sockets. They are actively being used. Finally there is a pushbutton that once upon a time could open the security door that allows access to the corridor. The button is no longer being used in this installation. 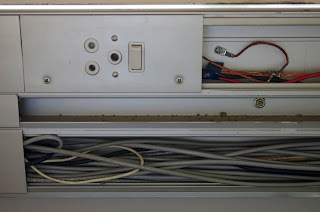 Removing the covers reveals the innards of the trunking. The top duct clearly carries the power lines - live, neutral and earth. The middle duct is unused. 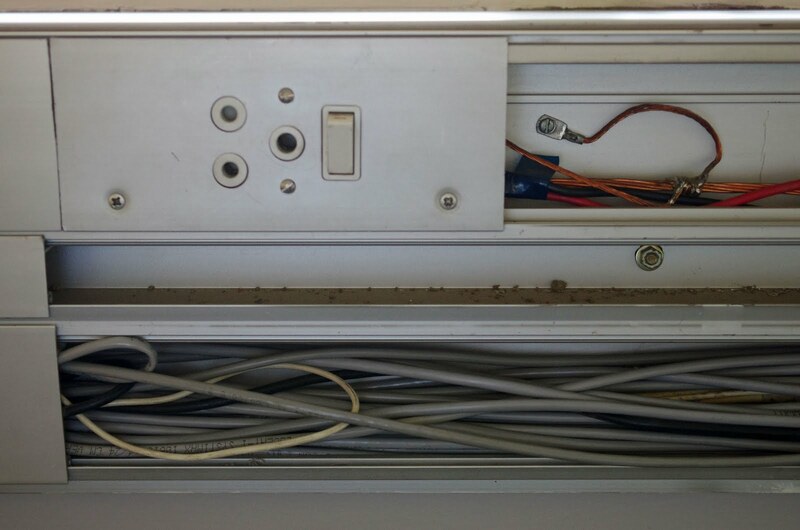 The bottom duct contains a large number of UTP cables - as one would expect in a modern setup. Note the black coaxial and cream phone cables also making an appearance. Also note the loops in some of the cables: When installing cables one quickly learns to take a cable beyond its intended termination point and then return with a loop. This gives one some space to work when attaching the socket or other fixture to the end of the cable.